Gerald L. Brockhurst. 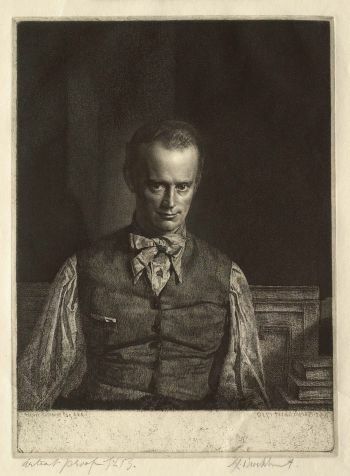 Portrait of Henry Rushbury No. 2, 1930. Etching on paper. Acquired by the Sterling and Francine Clark Art Institute. Frank Short, after George Percy Jacomb-Hood. 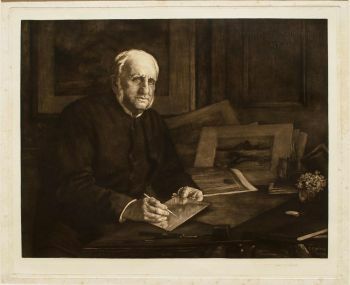 Portrait of Sir Francis Seymour Hayden, 1901. Mezzotint on india paper, mounted on heavy wove paper. Acquired by the Sterling and Francine Clark Art Institute. Stephen, Sir Leslie, and Sir Sidney Lee, editors. Dictionary of National Biography. London: Oxford University Press, 1920– . The single most important reference work for English biography. Signed articles by specialists, excellent bibliographies. Important names treated at great length, lesser names more sparingly; all are reliable and scholarly. Includes all “noteworthy inhabitants” of the British Isles and the Colonies; also notable Americans of the Colonial period. No person still living is included. Supplements bring the record down to 1990; each supplement has an index of all names up to that point in the series in one alphabetic sequence. Buckman, David. The Dictionary of Artists in Britain Since 1945. Bristol: Art Dictionaries, 1998. Brief entries cover painters, sculptors, draughtsmen, teachers, and video, film, installation, and performance artists born in the U.K., as well as foreign artists whose work has been significant. Those who are primarily illustrators or craft workers (e.g. potters) are not included. Entries include name and dates and a brief biographical sketch that includes schooling/training, membership in artists’ associations, awards, exhibitions, and career overview. Johnson, J., and A. Greutzner, compilers. Dictionary of British Artists 1880–1940: An Antique Collectors’ Club Research Project Listing 41,000 Artists. Woodbridge, Suffolk: Antique Collectors’ Club, 1976. Brief entries for 41,000 artists, mostly painters, who exhibited between 1880 and 1940 at any of 49 venues (museums, artists’ societies, commercial galleries) in the British Isles. Entries give basic biographical data, where known, and tell how many works were exhibited at each venue but don’t give the date of the exhibition. An attempt to broaden and extend Algernon Graves’ A Dictionary of Artists Who have Exhibited Works in the Principal London Exhibitions from 1760 to 1893 (Stacks N5036 G7 1901 Repr. ).